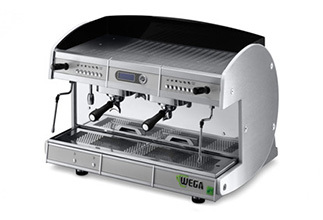 Wega was founded in 1985 with the objective of producing quality professional espresso coffee machines. Our new, technological plant in Susegana (TV) covers a surface area of more than 20,000 square metres. As the largest individual espresso coffee machine factory in the world, this is our flagship establishment. Wega conforms to ISO 9001 norms and holds the relevant certification. All Wegamachines display the most important stamps of approval in the world and are officially recognized by the Italian espresso Institute (INEl). All Wega espresso machines belong to the "UL" category of safety standards and conform to "ETL" norms for cleanliness prescribed by the "NSF-4" standards. Wegaconcept thanks to its innovative software,has the ability to memorize the workload of the machine, thus adjusting the work and standby functions accordingly. The multiple boiler technology, apart from the energy saving function which distributes power to the individual boilers only when required, guarantees an increased thermal heat stability of the coffee brewing boilers, giving us a perfect espresso.